Water into wine: what’s going on?! Yesterday at church the theme was ‘Jesus turns water into wine’, from John 2:1-11. It’s a well-known story – if you’ve ever been to a wedding in an Anglican church, for example, you will have heard it mentioned in the introduction – but the story is nonetheless quite puzzling. To be honest with you, I’ve never really understood it properly: does Mary force Jesus into doing something he didn’t want to do? Did Jesus basically provide people with a load of decent plonk for free, for no reason other than the fact that he was asked to by his Mum? What was the point? Does that really sound like something Jesus would do? I don’t know about you, but these kind of questions have always plagued my mind – even when I was studying John at college a couple of years ago, it was still difficult. However, as I was listening to the passage and sermon I had a few thoughts, and I thought I’d write them up in case they’re useful for anyone else. Obviously there are many things you could say about this passage, and I will only be able to pick up a few of them, but hopefully this will help to shed some light. Notice in the first couple of verses, John writes “Jesus’ mother” – twice – as if he wants to stress the fact that Mary is here acting as Jesus’ mother. 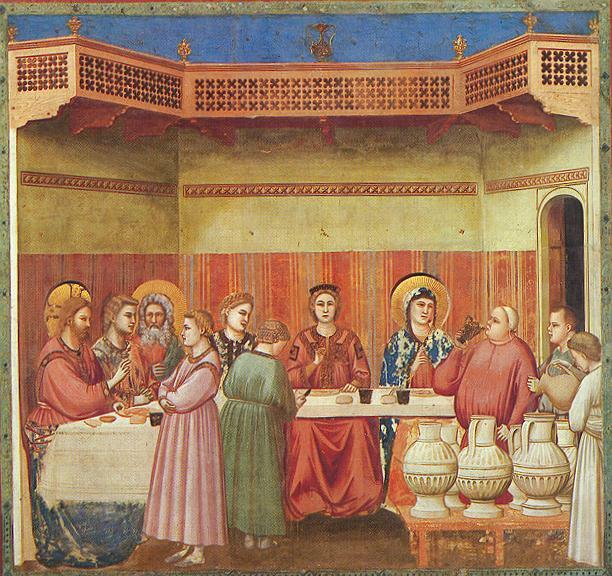 In contrast, Jesus “and his disciples” were invited to the wedding – note that Mary is specified separately to the disciples. Mary is not included as a disciple here. And I think this leads on to Jesus’ reply to Mary: “Woman, why do you involve me?” Why doesn’t Jesus call Mary his mother? Even if, as the NIV footnote points out, ‘woman’ was not a disrespectful term – in the normal way, wouldn’t Jesus have said ‘Mother’? I think this is significant: Jesus is highlighting the fact that Mary does not have maternal authority over him. In a sense, Mary is not Jesus’ mother in the same way that the Father is Jesus’ father. In John 19:25-27, Jesus essentially hands over the mother/son relationship to the beloved disciple – I wonder if that is him providing for his mother in the way he was unable to as an ordinary son would. (In this place, too, Jesus calls Mary ‘Woman’). Either way, it seems that the point of this is that if Mary is to have a relationship with Jesus, it should be the relationship of a disciple. At this point in Jesus’ life, the need for Mary was to believe in Jesus along with the rest of his disciples – not to be a mother to him. Throughout the whole gospel John gives us little pictures of what it looks like to be a follower of Jesus, and here – as in many other places – he is showing us that what we all need to do is put our faith in Jesus. Another puzzling aspect of this story: does Mary force Jesus into doing something which he didn’t want to do? When Jesus says, “my hour has not yet come” – why does he then go ahead and perform the miracle? If you read through John, Jesus talks a lot about his ‘hour’ of glorification coming. This culminates in 12:23, where Jesus says “The hour has come for the Son of Man to be glorified” – referring to his own death. In other words, the hour of Jesus’ glorification is the cross: for John, the cross is the place where Jesus’ glory is revealed. In 2:11, we see that “What Jesus did here in Cana of Galilee was the first of the signs through which he revealed his glory”. So this sign, the turning of the water into wine, should say something about Jesus’ glory – it should say something about the cross. It’s not just a simple miracle, it is a sign. But what sign is it? I think here, as with what we have already seen, the clue is in the details: Jesus doesn’t just turn water into wine in an unspecified container. He turns water into wine, John tells us, in “six stone water jars, the kind used by the Jews for ceremonial washing”. The kind used for ceremonial washing, i.e. the kind of jars that were used in the context of ritual purification and worship. And Jesus doesn’t just turn the water into any old cheap plonk – he turns it into the finest wine, wine which causes the master of the banquet to exclaim “you have saved the best till now”. What’s the significance of wine? We know from Matthew 26:28 and elsewhere that wine is used in communion as a representative of Jesus’ blood. Although John in his gospel doesn’t include the last supper per se, Jesus does say in John 6, “Very truly I tell you, unless you eat the flesh of the Son of Man and drink his blood, you have no life in you.” So I think it’s quite likely that the wine in this story here is symbolic of Jesus’ blood – the blood which will bring ultimate purification, the blood of the new covenant which cleanses from sin once for all. So what can we say about this passage? As with many things in John, I think there is an element of misunderstanding and irony going on: Mary thinks that she is doing one thing – compelling Jesus to provide wine for a wedding feast – whereas Jesus is actually showing a sign which illustrates what he has come to do. We see that Mary attempts to assert her authority as Jesus’ mother, but in actuality what she needs to do – as we all do – is turn to Jesus as a disciple. And we see that Jesus came to turn the imperfect nature of purifying with water into the blood that cleanses from every stain of sin. This is my fourth post on John’s gospel – if you enjoyed it, you might like previous thoughts I’ve had on John: the woman at the well, the raising of Lazarus, and Jesus’ trial and crucifixion. PreviousPrevious post: The Church’s Mission: What’s the point?